One of our most common wild currant species, an undemanding and adaptable shrub. It may grow on sand dunes, shore pebbles or in fresh broadleaf forests and floodplain forests. The shape of the bush has great similarities to the red currant bushes growing in gardens; leaves are a little smaller, with three, seldom five lobes; the colour of the berries the same, but not set in the well-known long hanging clusters. The fruits are edible, but insipid, vapid, cloying or tasteless – however one wants to describe it. Birds eat them and spread the seeds. Grows locally in forests, more frequently at river banks, in fresh deciduous forests, sometimes at the seashore. Blackcurrants grown in gardens may also escape into nature. On crushing the leaves or shoots between ones fingers the familiar smell is felt at once. The berry clusters are less dense sparse and the berries smaller. Grows locally in deciduous forests and wooded meadows. It is actually our wild "red currant“ – the berries have the same acid taste, but it sets fruit poorly in the forest. The leaves are a little more rounded than those of the relatives; sparsely hairy on the upper side, densely on the underside, which has also given it the Estonian name "karvane"..
An unassuming ornamental shrub that on rare occasions goes wild is the golden currant or clove currant (Ríbes aúreum). An erect shrub with young shoots that are coloured red and hairy. Tasty fruits, reddish-brown, sometimes black, with a pleasant taste. In autumn the leaves turn red. 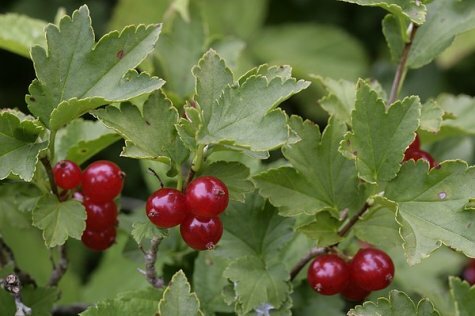 The alpine currant (Ribes lucidum) can occasionally grow in mixed forests. The leaves are narrower, which is emphasized by the long middle lobe. Has round red fruits with an unpleasant taste. Red currants (Ríbes rúbrum) and white currants (Ribes rubrum f. leucocarpum) are also occasional garden escapes. They often mark some ancient farmstead; growing at the verges of forests or roadsides they are pleasant surprises to enjoy. Garden gooseberries, also belonging to the Ribes genus, behave similarly.